Al-Qaeda's Magazine in Yemen: Where's Our WikiLeaks Scoop? The producers of Inspire, the online magazine by the Yemen-based al-Qaeda in the Arabian Peninsula (AQAP) must now feel the frustration familiar to editors around the world, when big news breaks just after you've closed your latest edition. 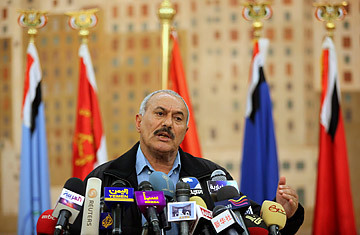 For Yemen's President Ali Abdullah Saleh, the latest WikiLeaks revelations are little more than an embarrassment. But it's a safe bet that AQAP will extract as much propaganda value from them as possible. "They will use these documents to say: 'See, just as we've been saying, the ruler of Yemen is a sinful man, who works for the Americans,'" says Mohammed Aish, a researcher on extremism in Yemen. The main audience for such propaganda may be the global jihad community, rather than Yemenis, Aish says. "This helps them in recruiting and raising money." The WikiLeaks trove includes a January cable from the American ambassador in Sana'a that suggests Saleh's government deliberately covered the fact that strikes against AQAP targets were executed by American drones. Another document records Saleh's exchange with Barack Obama's top counter-terrorism advisor John Brennan: the Yemeni President complains of smuggling from nearby Djibouti, but says he's mainly worried about the illegal inflow of drugs and weapons, not whiskey  "provided it's good whiskey." This is golden grist for AQAP, which regards Saleh as an American stooge. The group has been luring jihadists and wannabes worldwide to the badlands of eastern Yemen, from where AQAP has mounted a string of deadly attacks on Saleh's security for forces and foreign diplomats. It has also launched several failed attempts to strike the U.S. homeland. But to make hay of the WikiLeaks sun, the producers of Inspire will have to scramble a new edition: the magazine's third issue was posted on Nov. 21, and used mainly as a platform from which to crow about AQAP's latest operation against the U.S: the dispatch of parcel bombs from Sana'a through the global courier service network. The bombs were intercepted in Dubai and the U.K., but set off a worldwide security alert. Inspire described it as a part of a "strategy of a thousand cuts" against the U.S. Published in English, Inspire is believed to be mainly the work of two Yemen-based Americans, Samir Khan and Anwar al-Awlaki. Previous editions of Inspire have taught readers how to make bombs using household items and at the end of the latest edition, the editors reached out to anyone interested in contributing, "be it writing, research, editing or advice." Although Inspire is thought to be the brainchild of Awlaki, Khan is said to be the principal author and editor. Evidently drawing on his success as a blogger, Khan has kept the look of the magazine fresh as not to bore its intended readership: disaffected Muslim youth. The latest edition is plastered with images of UPS planes and shiny graphics. Articles submitted by AQAP leaders are short, unlike the lengthy sermons most often associated with al-Qaeda. In the first edition of the magazine, Awlaki  sometimes called the "bin Laden of the Internet"  wrote as a "guest writer," legitimizing the magazine to his English-speaking fans. At the end of this month's parcel bomb special issue, three pages are taken up in a section titled "Hear the World: a collection of quotes from friends and foe." It shows pictures of U.S. news anchors and quotes about the parcel bombs all pinned on the a corkboard  a way for media-craving Awlaki and Khan to advertise AQAP's work and pressclips. Khan's name also popped up this week in connection with the alleged plot to bomb Portland's Christmas tree: reports say the man accused, Mohammed Mohamud, published three articles in 2009 on a blog Khan ran from his home in North Carolina. AQAP's propagandist will likely want to crow about that, too, in the next issue of Inspire. But AQAP doesn't need it's own mouthpiece in order to make news. This week, it acknowledged responsibility for a suicide bombing on a Nov. 24 religious procession that killed 23 people north of Sana'a, in an area where a Shi'ite rebellion against the government has raged off and on for several years. It was the first time AQAP, a fanatically Sunni organization, has struck in the stronghold of the rebel Shi'ite group known as the Houthis. Shi'ites make up around 45% of Yemen's population, but a much larger proportion of the ruling elite, including President Saleh. The Houthi uprising has less to do with sectarian issues than tribal and territorial grievances. Many here see the bombing as proof AQAP is seeking to stir up sectarian differences, as al-Qaeda's Iraqi arm did with such bloody effectiveness from 2005 to 2007. In Iraq, al-Qaeda's relentless attacks on Shi'ites led to a backlash against the Sunnis. In a statement posted on jihadist websites on Sunday, AQAP said the Houthis were "legitimate targets," and warned it was preparing more attacks against the community. "[We] decided to begin with this martyrdom-seeking operation in defence... of our Sunni brothers." Sunnis make up an estimated 52% of Yemen's population.